Dress: Romance was Born (also love the skirt version here and here). Worn with this sweater (I also bought this heart sweater and want this kids sweater!). Shoes: Coming soon ;). Coat: Zara, last seen here. Bag: Gu_de. ALSO the Shopbop stock up sale has started! Get up to 25% off with STOCKUP18. I ended up buying these, this and this! Oh friend – you know I’m dying over this! So sooo cute … love ♥️it! Your skirt is amazing. Love it so much! That skirt is the coolest thing Blair!! That is the cutest, most fun skirt ever! I love the rainbow colors and how cheery they look. Love the bold colors and pattern mix! 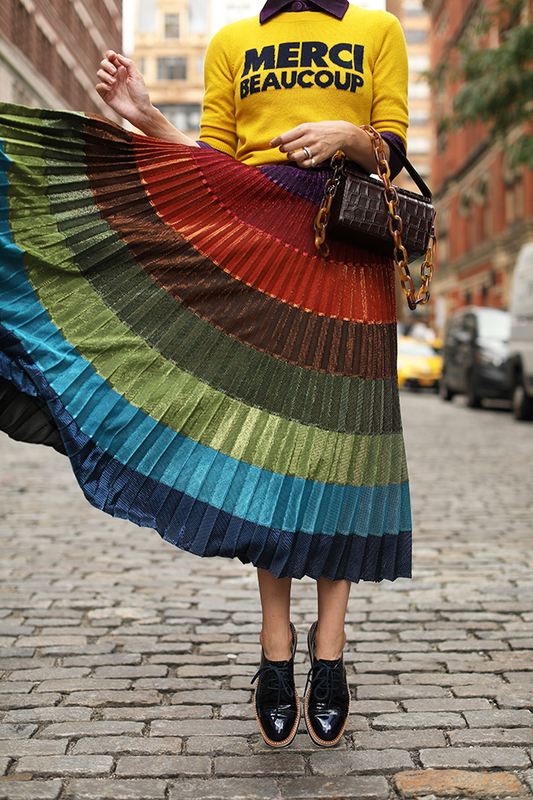 That rainbow skirt is stunning! The rainbow dress is so lovely! I adore how you styled it with an equally colorful top.